As an expedition ship visiting unusual places is the norm for the intimate (132 passengers) Silver Explorer. But on three of its expedition sailings, Silversea has added a culinary expedition to make it a complete adventure. In addition to the exploration itineraries and the sightseeing features you normally expect on Silver Explorer, it will also include an array of complimentary culinary and wine events on board and ashore. The complete story appeared in the May 27 edition of Cruise News Daily. As we get closer to the date when Queen Mary 2 will be “remastered” in dry dock in Germany, Cunard keeps giving us tantalizing little peaks behind the curtain. Earlier this week they released a video of what the iconic ship’s Grand Lobby will look like after the refit. Fathom has added some new programming aboard Adonia that passengers will experience as the ship sails to the Dominican Republic and to Cuba. The new program was developed for Fathom by Ashoka, the world’s largest network of social entrepreneurs. The complete story appeared in the May 26 edition of Cruise News Daily. When Queen Mary 2 returns to service next month after its refit, it will have a new feature that will mean nothing to many people. It will be a wonderful find for others that will be one of the highlights of their time aboard the iconic flagship - if they can afford it. Experts have spent more than a year assembling a new fine wine cellar for Queen Mary 2. Four hundred and fifty fine wines comprise the collection along with a unique assemblage of vintage ports, each produced in a key year of Cunard's 176-year history. Many of the port wines will be on display in the new Carinthia Lounge. Details appeared in the May 26 edition of Cruise News Daily. With the focus on so many new ships entering service over the last month, a pending major new order by Royal Caribbean slid in today with STX France with virtually no advance rumors. The company ordered an additional Oasis-class ship (the fifth) for Royal Caribbean and increased their order for Edge-class ships for Celebrity by two (for a total of four). The Oasis-class ship will be delivered in the spring of 2021, and the Edge-class ships will be delivered in the fall of 2021 and the fall of 2022. 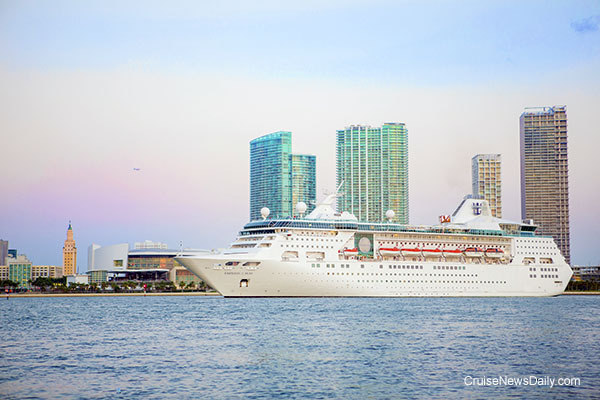 Royal Caribbean’s Empress of the Seas returned to Miami today, rejoining the RCI fleet after a stint with their Pullmantur brand. The ship went into dry dock in February to undergo the line’s rejuvenation process, and it was extended through most of May as additional work was done on the ship, including a complete refit of the galley. It ended up being a $50 million total tab for the refurbishment process. Two former crew members from Royal Caribbean’s Freedom of the Seas have agreed to plead guilty to charges of importing a controlled substance into the US. The pair was arrested late last month aboard the ship after it docked at Port Canaveral. The pair was allegedly part of a drug smuggling ring. Disney Cruise Line will return to New York, San Diego and Galveston for short series of programs in the fall of 2017. They will be encores of previous years’ except that each will have some new changes to the itineraries. Before you get excited, however, realize each program is only a few weeks long; it’s not he beginning of a permanent deployment. Carnival Corp said today they are consolidating their media buying in North America and the UK for seven of their ten brands. Omnicom’s PHD currently handles two brands, and five more will now be consolidated into PHD’s coordination and buying in the two regions. Currently six agencies handle the buying for the seven brands. After and extensive review and analysis, PHD was chosen to coordinate the media purchases, which last year for the seven brands totaled $116 million. The consolidation is expected to result in a multi-million-dollar savings. There’s a new law in Australia’s state of New South Whales that says cruise ships must use low-sulfur fuel while berthed in Sydney. The first ship to get fined was Pacific Jewel (a $15,000 fine). But Carnival (P&O Australia’s parent) isn’t just going to pay the ticket. They say they were using the right fuel at the right time and that the EPA’s test was bad.